Universal’s 1999 The Mummy starting Brendan Fraser and Rachel Weisz raised back to live this evil character to the top of glory. The film based on the 1932 horror classic showed to the audience a new approached to the story, this time around, it looked more like an Indiana Jones type of movie, filled with adventure, top of the art special effects, a few scares, and a considerably appealing story. The movie was an instant success, it attracted fans of all genres and ages. It was such a hit than a second part was released two years later, and although not as convincing and attractive as the first one, the actors and staff created an almost as good sequel that pleased most of the fans. Then, the downfall began, in 2002 The Scorpion King, a spin off of the series based in one of the characters from the second film hurt what up to now had been a successful franchise, the story seems overplayed, a classical hero movie that did not added nothing new, and the special effects, although impressive and pleasing, make the movie seem repetitive and predictable, nonetheless, for what it was worth, it kept the audience somewhat interested and entertained. After almost ten years from a remarkable first movie, an acceptable sequel, a mediocre spin off, a boring TV cartoon series it looked that the franchise was doomed. Then a great Theme Park ride came up, and it brought a narrow beam of light to the curse creature, unfortunately, the last attempt of Universal to raise the creature’s respect back up seems to have backfire. The Mummy: The Tomb of the Dragon Emperor, although looks promising and exciting, turns out to be disappointing, unoriginal and just dull. In this new mummy, it has been almost 20 years since the O’Connell vanquished Imhotep from the world, now Richard and Evelyn O’Connell are enjoying their delightful life of retirement, apparently they used to work as spies for England, their son, Alex, has drop out school and he is dedicated in the pursuit of adventure, as a archeologist assistant in China, and conveniently enough Uncle Jonathan is now the owner of the prestigious Imhotep night club, also in China. As perfect as this could seem Richard and Evelyn are not happy, their son barely talks to them, and they missed all the excitement from their previous adventures, luckily for them, Alex finds what seems to be the tomb of the dragon emperor, which was a powerful and ambitious ruler who The Mummy: Tomb Of The Dragon Emperor reign over China and the whole world for eternity, and the British government asked them one more favor, to deliver a precious jewel to the Chinese government as sign of good faith. The O’Connell agree, in China the gem is stolen and used to revived the emperor, whose ambitions still the same. Now is to all the O’Connell’s to stop him for regaining his powers and save the world. The film is beautifully shown, the CGI effects, settings, action sequences, and John Hanna’s performance are without a doubt its high points. The problem reside in the story, characters, and the acting. The story for once is predictable in all aspects, in the others mummy movies the villain aside greed and being all powerful had other motives like reuniting with his love, which make him appealing to the audience and added more to the overall story. Here it is not the case, the bad guy is just bad and greedy, that is it, no rivalry between heroes and villain is achieved in this movie. The story is so straight forward that it becomes predictable to the point that you lose interest in it. The special effects although beautifully and masterly depicted, went over the edge in this movie creating an awkward feeling since everything looks so good but it is so meaningless. Acting wise aside Mr. Hanna, which performance is smart, fresh and funny, all of the rest of the cast performed below their level. 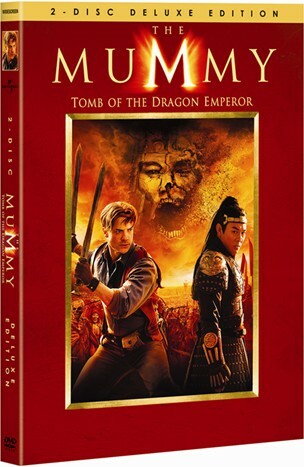 Brendan Fraser looked like he did not The Mummy: Tomb Of The Dragon Emperor to be there; he lacked the humor, charmed and appealing personality that had characterize him, nonetheless his performance is acceptable. Luke Ford looked the same all the time, he did not showed any emotions in his character. Maria Bello was trying too hard, The performance was not bad but it seems that Weisz performance overshadowed her. The chemistry between her and Fraser was just not there. Jet Li, well, he did not have enough time to act, when he was the Mummy, it seems that he just lend the CGI designers borrow his image, and as the dragon Emperor he did not have enough screen play to act or perform his skillful acrobatics, and since he was the bad guy eventually could not be that impressive, because at the end Fraser had to beat him. The rest of the supporting cast did an acceptable job. In a summer filled with exceptional blockbusters, I was hoping for the mummy to make his way up as one of my season‘s favorite, probably was the level movies like Iron man, Indiana Jones, and Batman set in this summer that made this Mummy looked mediocre and weak. The movie lacks an engaging story, the script relies too much in overused and unnecessary comical remarks and pointless visual tricks, which makes it uncomfortable to the audience. Let us hope for Universal not to try to squeeze these franchise any longer with mediocre versions, I see in a future The Mummy : Imhotep vs. Dragon Emperor, but if they decide to bring them back again I hope that they put more thought in storyline and character development. Otherwise, just let the Mummy rest in peace with dignity for another 2000 years. DVD: The 2 Disc Deluxe Edition includes more than 90 minutes of special features and it will be available for limited time only with a digital copy. Most of the special features in this edition, takes viewers beyond the making of the film. With "The Making Of The Mummy: Tomb Of The Dragon Emperor" and "From City To Desert" featurettes being the best of the pack. It also contains a nice piece called "Legacy Of The Terra Cotta", in which Rob Cohen discusses what is historically accurate in the film. It also include a total of 10 deleted and extended scenes. And of course it comes with a digital copy. You can read the full list of special features below. Overall this 2 Disc Deluxe Edition includes mainly what fans want it to see, plenty of good behind the scenes materials to be enjoy.